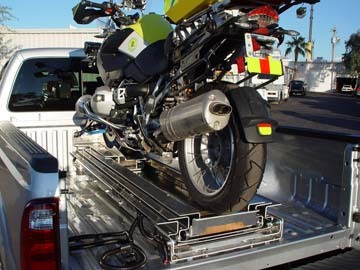 THIS IS THE ONLY LOADING SYSTEM THAT PROVIDES THE ABILITY TO SERVICE OR CLEAN THE MOTORCYCLE AT WAIST HEIGHT WITH 6 FEET OF THE BIKE PROTRUDING FROM THE BACK OF THE TRUCK, THANKS TO THE WINCH SYSTEM. The Motorcycle Loader, easily and safely loads and unloads your motorcycle. From the ground to the back of your vehicle, one person can safely load and unload their bike while never getting on the motorcycle by pushing a button on a remote control switch. The Motorcycle Loader allows for storage and still allows you to pull a boat or trailer. The unique configuration fits into most full-size or mid-size pick up truck beds and has the ability to be installed in very short truck beds such as Chevy Avalanche or Honda Ridgeline. 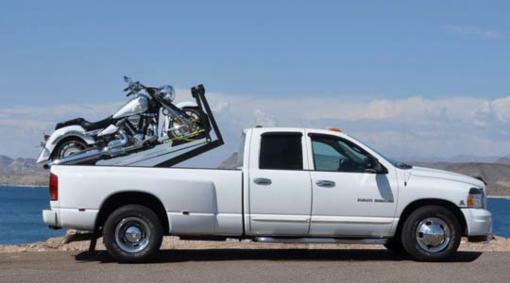 4' AND 5' TRUCK BED LOADERS AVAILABLE WITH "LOAD BEARING RECEIVER HITCH DOLLIES" TO STABILIZE THE LOAD WHILE DRIVING AND CARRY THE MOTORCYCLE WEIGHT CORRECTLY. This Motorcycle Loader takes all the work out of loading or unloading your full size bikes. The Hydraulic Loader features a 12 volt powered Hydraulic Pump that runs directly off your truck Battery. The Hydraulic Pump is made of the best materials and workmanship featuring Made In The U.S.A. quality. The entire loading system is made in our Phoenix Az, Factory on a precision C&C Plasma cutting table, Raw materials are formed on our C&C press and then Powder coated to ensure years of trouble free use.